First review and an earned vacation. On Sunday this blog will be online for 3 months now. 25 posts were written in that time and so far viewed 1050 times. I´d like to thank all my friends, family members and other frequent readers, crawlers and spam bots for their interest in my rather unspectacular life. 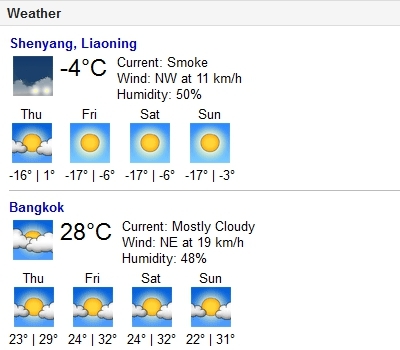 Tomorrow we will leave for Thailand for a so-much-earned 2 1/2 week vacation. Having had temperatures below zero permanently for the last two months cries for a little "climate change". A weekend in Harbin: Tigers, a Wedding and a city made of ice - Part 3: A big fat Chinese wedding. Sunday was Toni`s and Jiarui`s big day as they got married. They met during their studies in the States and decided to live in China afterwards, in Jiarui`s home town Harbin. We know Toni from university back in Germany, and as by living in Shenyang being his (geographically) closest friends from that time we were invited. As the distance from either Germany and the USA to Harbin is pretty far, we were the only "foreigners" at the wedding, besides Toni`s parents and brother, of course. But this didn`t take away the requirement of a huge wedding ball room to celebrate, as at least 150 people from the Chinese side were invited - family, relatives, friends, colleagues, former fellow students. If it`s affordable for the families, Chinese do weddings big time. And this room had everything - a huge chandelier, big and loud P.A., a stage and even two hired presenters hosting through the ceremony. The dominating color in Chinese weddings is red, as this is the color of happiness and good luck in China. Almost all typical wedding decorations have this color, in our case even the furniture and walls of the ball room were red to ensure the couple will have a good start. Food plays an important role in Chinese society, and there`s naturally no exception of this at a wedding. Guests are usually grouped up to eight persons per round table and every table is filled with as much dishes as possible. A lot of them have symbolic meaning. So for example fish is normally served at every wedding, as the character for fish 鱼 (yú) is pronounced the same as the characters 余 (surplus,extra) and 逾 (to exceed, go beyond) and therefore stands for abundance. Also, as the groom is often referred to as dragon and the bride as phoenix, lobster (龙虾, "dragon shrimps" in Chinese) and chicken feet (they represent the phoenix, as it is a bird) are a typical dish. If you don`t have lobster, any ordinary shrimp will do too. There are a lots of other meanings in what and why it is served, but it was my first Chinese wedding until now - I´ll save some of the mysteries for future weddings to be solved. An ancient Chinese wedding tradition that is hold up till today is a small tea ceremony where the newly-weds offer each others parents tea. The same is done with 白酒 (báijiǔ), the Chinese schnapps, and the couple also drinks wine together with their arms intertwined. My best wishes to the Newly-weds. And to the Li family, probably one of the kindest in China. A weekend in Harbin: Tigers, a Wedding and a city made of ice - Part 2: Illuminated frozen water still can be impressive. Because it was still only around noon and although winter still a lot of time to kill until the sun would set, we drove to the snowy parts of the city first. We stopped at a huge snow monument on a deserted square. It`s strange shape, it`s size and the fact that besides us nobody was there, that`s how I imagine walking the streets of Pyongyang. Toni, the then groom-to-be, climbed this oddity, and exactly when I took the pictures the camera got "blinded" by the brightness of the sun and it`s reflection in the snow. Became still a good enough picture, though. Next stop was the "Metropolis Snow Home". Well, Metropolis really was an exaggeration, as it was not even merely a village, more a bunch of huts and some snow statues, but still nice to see. It´s made from snow, after all, although some of the huts were made of wood with a snow facade built around them.Still lovely. After a hearty meal at a dog meat restaurant (as Toni`s parents and brother were in China for the first time, that of course was a must) and some relaxing in the hotel, in the evening we finally went to the "Snow & Ice Big World", and, what can I say, I guess the pictures below speak for themselves. It`s actually a good thing that the place was pretty crowded as it allows to show the size of the buildings compared to a man - some of the buildings were several storeys tall and you could actually access several floors of some of them. Amazing, isn`t it? Definetely recommendable. And for the finish our favorites - made of snow, not ice - two gigantic.... well, I guess Hindu ... goddess statues. 1. As it was found by Russians and didn`t became part of China until 1946, you can see a lot of this influence in the architecture of many older buildings, which gives the city a slightly unchinese flair of it`s own. 2. The oldest brewery of the country - Harbin beer is brewed since 1900, 3 years before the Germans installed their brewery in Qingdao - which is the most famous Chinese beer brand nowadays. 3. For being incredibly cold in winter - temperatures can go down as low as -40°C during nighttime, temperatures drop below zero already at the end of October and won`t go above that mark again before the beginning of April. Well, Harbin made the best out of it and hosts one of the biggest "Ice & Snow Festivals" in the world. We always wanted to go there. Additionally, a friend of us got married in Harbin this weekend. Finally given the fact that going there by train takes less than 5 hours, the trip had to be made. And the story and pictures about this 2 day trip shall be presented to you in 3 parts. In the morning we got picked picked up by the father and an uncle of the bride (more about Chinese hospitality in the third post) and drove to the "Harbin Siberian Tiger Reserve". On an area of around 1,5 mio. sqm, divided into 10 districts, about 500 Tigers live there, some 100 something visible for visitors. The difference to an ordinary zoo is that within the reserve the tigers can roam freely and are not held back by cages or fences within a district - the latter separate bigger from smaller, older from younger tigers as well as different kinds of tigers to avoid fights among them. You tour the reserve in a bus and of course are not allowed to leave it as it`s too dangerous. The bus stops every time a tiger is in sight somewhere close to the road, which happened quite often, so that the "picture hunters" could get got shots with their huge telephoto lenses. The tigers seemed used to buses crossing their territory every 5 minutes or so and seemed not to be disturbed by that (anymore), as they sat, walked or even took naps very close to the road and didn`t hide in the bushes when we came close and stopped right next to them. The spoiled beasts of course already have adapted to this attraction and preferably circulate the area around the passageway as they know that there food will be thrown out every other minute. As we were there, only big slices of beef or live chicken were "available". And as you can see, food for tigers isn`t treated much more "humanly" as the food we eat. In China pretty much the same, I guess. Then comes the "fun part". Hold out the live, fluttering chicken to attract the tigers, throw it over the fence and watch the tigers fighting over it for a couple of seconds until one finally walks away with it in it`s mouth, looking for a laid-back spot to start eating it. While the chicken`s still alive for quite a while. Yeah, that`s nature. Never really know what I should think of attractions like these - a wildlife reserve is probably better than an actual zoo with tiny cages, and as siberian tigers are endangered to go extinct, question is if they would have a better life (or a life at all) in the wild. 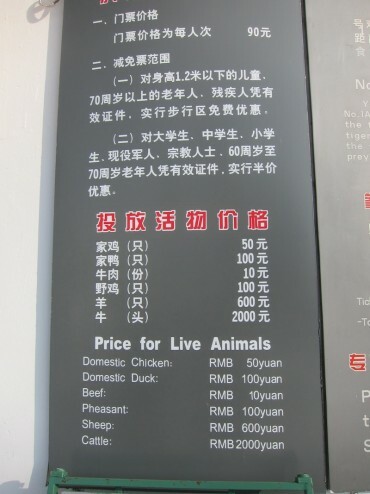 Still, offering feeding live animals as an tourist attraction seems a bit macabre at first, especially if they`re treated like s... before. 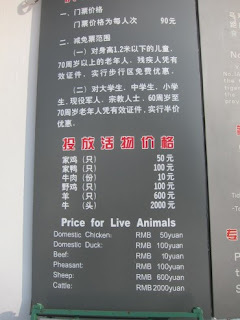 But then, as already mentioned, I´m afraid animals designated for food in China have a hard life in general. And I guess in most parts of the world. As tigers are carnivores and hunting down animals is in their nature, I don`t know if there`s a ethical difference if you let their food roam freely before so they have to get it themselves, throw it at them to watch them fight over it or kill it already before and feed it to them in pieces. Feel free to post your opinion.